"Allegra!" This soft greeting sounds like alphorn music to our ears. It is also a surefire sign that we have left the city for Switzerland's eastern Alps where the locals speak Romansh. We have not only entered a new linguistic territory, but a geographical one, too. 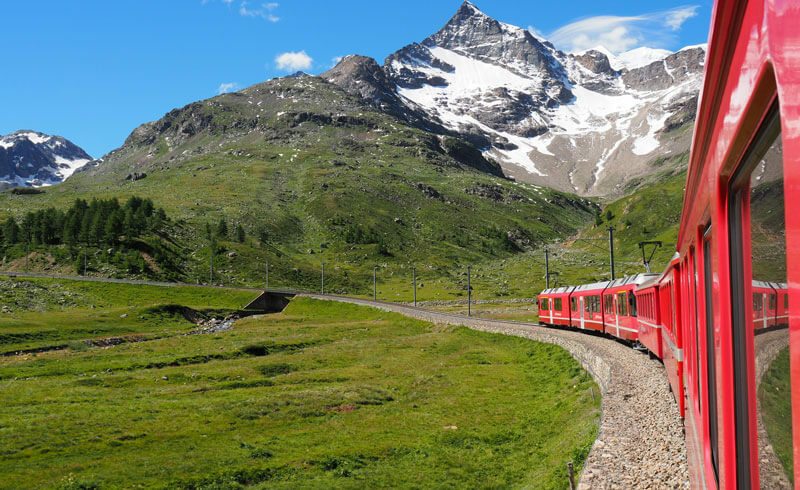 This is our first time to visit the Upper Engadine Valley which stretches from Samedan to glitzy St. Moritz, and finally the Bernina Pass in the south. In between lies Pontresina. The name of this sun privileged town evokes memories of a vintage tourism poster showing a tanned skier. And yes, after this summer weekend in the sun, we will be returning to the city with an Engadine tan... But I am jumping ahead of myself! The town of Pontresina with its historic church is as charming as can be, and our hotel turns out to be part of the bedrock that makes up this community. It's a hotel for all ages. We have lodged at more than a couple of four-star superior hotels where the only sign of life was the bar pianist. Not so at Hotel Saratz: The open lobby allows for casual interactions among guests and the staff. And with the Saratz being a family hotel, it is not uncommon to see kids chasing one another through the hallways. (Well behaved kids, we should add.) 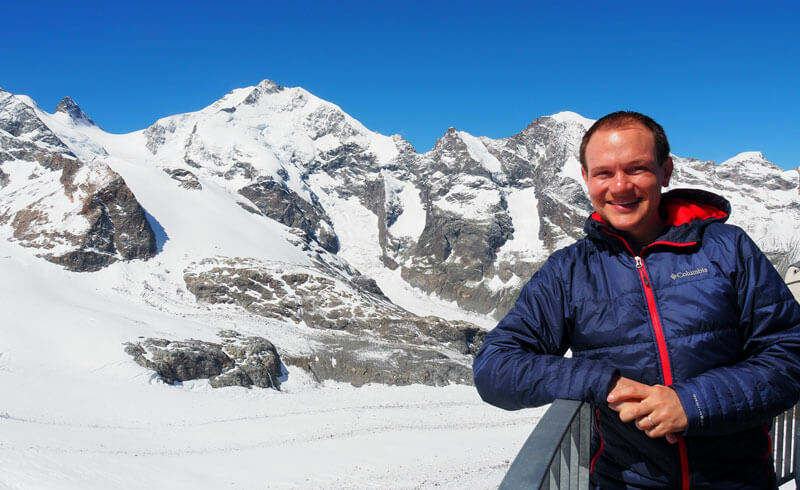 Mr. Geiger, general director at Hotel Saratz, confirms that his house is catering to families, many of whom return year after year: "We even provide a room discount for parties of three generations - or more!" The architecture reminds of another era (while offering today's level of comfort). Just last year, the hotel celebrated the 150th anniversary. And when you open up your eyes, traces of the rich history can be found all around the hotel and its majestic grounds. Swiss Historic Hotels has recognized this legacy, making Hotel Saratz one of 53 hotels in its directory. Back in 1960, Hotel Saratz was the first property in Engadine to attempt the unthinkable: Constructing a heated outdoor pool. Remember, these were times before the bikini was invented and when children's swimsuits were wool knit. But the vision of the owners back then has lasted through times and can still be enjoyed today. The hotel has two separate in-house restaurants which are included in the half board. One night, we enjoyed dinner at the hip Pitschna Scena in the original part of the hotel. We immediately noticed the askew floor, and in turn, the waiter must have noticed our puzzled faces: "In the beginnings of the hotel, this used to be a bank. Your table is located where the heavy safety box used to sit - the reason why the floor has sunk over time..."
Our favorite part of the hotel? The Art Nouveau dining hall with its 13 point Gault Millau kitchen. 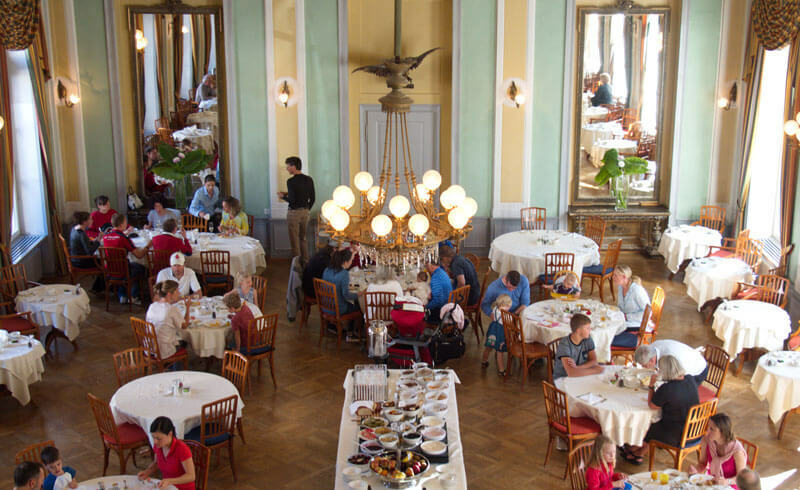 It felt exclusive yet surreal in a Wes Anderson kind of way to be dining at the Jugendstil Restaurant. The place is so historic, and we can just imagine how the riches back in the day used to sit at those same tables. Likely, their appetizers were nowhere close to smoked salmon on a bed of Japanese seaweed, however. At the Saratz, sustainability is more than a buzzword. The Saratz has always been a family business, having undergone several major renovations through the 150 year history. While talking to Mr. Geiger, it becomes clear that a long term focus is characteristic for many family owned hotels. At Hotel Saratz, this kind of mentality was necessary to attempt yet another unthinkable act in more recent times: Drilling 1350 meters into the ground - through layers of granite! The reward? Access to sources of naturally warm water at 40 degrees Celcius. By pumping the H2O to the surface, geothermal heat is being extracted, which in turn helps to heat the indoor pool, the spa with saunas and a Turkish steam bath, and parts of the hotel property. We like a hotel where sustainability is part of the philosophy. This measure saves the Saratz 80'000 liters of heating oil every year. This is likely a multiple of what can be saved by asking guests to reuse bath towels, like most hotels do. There is an in-house hiking concierge. Nikolai Kaya from the front desk was our man, and the hikes he recommended from his own experience were absolutely stunning. One afternoon, he suggested the panorama trail starting at Muottas Muragl. Due to the unseasonably cold weather, we skipped the (bucket list worthy) climb to the famed Segantini Hut. Instead, we sloped around the mountain across rock fields and through pine forest to end up back in Pontresina. We had plenty of time to soak in those magnificent views, and we still made it back within three hours. Heck, we even kicked off our hiking boots for a refreshing Rivella somewhere along the way. Back in the valley, we hop onto the iconic Rhaetian Railway train you have likely seen in UNESCO brochures. Our advice is to ride towards Alp Grüm along Lago Bianco for that perfect view. From Alp Grüm, you could decide to hike back to the train station Ospizio Bernina, then take the train back to Pontresina. Notice the glaciers moraines providing melt water to the raging Inn river. And as we lean out the window with our cameras strapped around our necks, we remember that this very route was the first electric railway in the Alps. - Editor's note: A minimum of two nights at Hotel Saratz are required for the transportation benefits to kick in.